A bit chilly eh, what? MAFRA, October 26 (RIA Novosti) - Russian President Vladimir Putin compared on Friday U.S. missile defense system plans for Central Europe with the 1962 Cuban crisis. Speaking at a news conference following the Russia-EU summit in Portugal, the president said the plans, announced in January, to deploy missile interceptors in Poland and a radar in the Czech Republic were reminiscent of the political crisis caused by the Soviet Union's missile bases in Cuba in 1962. "The situation is quite similar technologically for us. We have withdrawn the remains of bases from Vietnam and Cuba, but such threats are being created near our borders," Putin said. The president drew attention to the fact that the decision to deploy missile defense system facilities close to Russia was preceded by a U.S. withdrawal from a defense treaty. President Putin was apparently referring to the Anti-Ballistic Missile Treaty which the U.S., unlike Russia, abandoned in 2002. 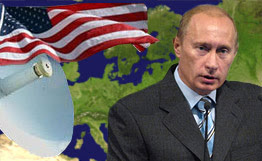 Although Washington claims the missile shield is needed to counter possible missile strikes from "rogue states" such as Iran and North Korea, Moscow, which has already been angered by NATO's eastward expansion in recent years, has consistently stated the move would be a threat to Russia's security and a destabilizing factor for Europe.